I’m just going to lay it out for you all, a lot of the information in the natural hair community can be questionable and have you walking in circles with your hair. Often when you’re newly natural, it can be hard know what is meat and what is bones. 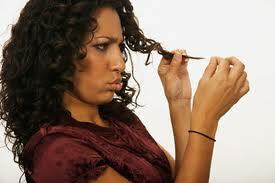 Here are 5 hair care mistakes you don’t want to make. - What’s a bandwagon? It’s going out and trying techniques and new hair tools just because others are doing it. Every month there is a new bandwagon; co-washing, no-poo, baggying, Tangle Teezer, and others are all bandwagons. While these techniques can be beneficial; if what you’re doing isn’t broken don’t try to fix it. Try only following techniques that solve a problem you currently have with your hair. - Yes, it’s nice to feel like you’re a part of a group but honestly, hair typing is purely aesthetic. Yes your curls can look like someone elses but, it takes more than knowing your hair type to really figure out what your hair likes and doesn’t like. You can learn a lot from people who don’t have the same hair type as you do. - Don’t go and throwaway that “tried and true” leave-in just because, you’ve now learned about mineral oil. Trust me, when you’re having a bad hair day, you’re going to be looking for that tried and true product. Again, if it isn’t broken don’t fix it. success and these aren’t marketed for “black hair”. Just find products that solve the problems you’re facing with your hair. - No, natural hair doesn’t have to be difficult but, we all have our days. Don’t go natural thinking that you won’t have any bad hair days or even months! Natural hair has it’s learning curves. By keeping the 5 tips above in mind while on your journey it will save you a lot of frustration, there’s is nothing like experiencing excessive breakage or slit ends and having no idea where they came from and how to stop them. If you keep your regimen consistent, you will get consistent results.